Action Contre la Faim : les 3AI se mobilisent pour Haïti ! Le dernier tremblement de terre en 2010 a fait 230 000 morts. A Haiti, 60% des habitants vivent en dessous du seuil de pauvreté. Now Mathilde, she’s working very hard on her job: she checks the importance of nutrition in Haiti. She finds the subject very interesting, and she would like to be nutritionist for the future. First, she thought that the blog wouldn’t work at all; she was even surprised that it was a real blog on the net but now she’s motivated and she’s anticipating what she will learn. Haiti is a poor island and must fight to improve her conditions. She deserves to be help. Last time, we spoke about to the fact to give food or, for, people who can, give money to association. And I gave you examples of different associations which you can ask, and I gave you “Action contre la faim”. 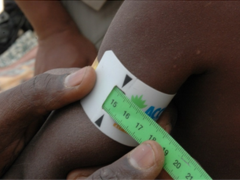 And today, we are going to speak more in details about what they concretely did to improve*1 the alimentation in Haiti and so to “save” the population. -red: the person is in danger ! They can die. If the people are in poor health condition*3, “Action contre la faim” will give food supplement. It’s called “Plumpy’sup”. It’s a texture made from peanuts, vitamins and nutriments. With that, they treat*4 the child and help them to grow. 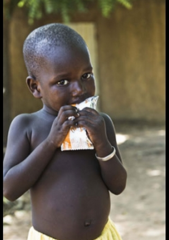 If you give money to “Action contre la Faim”, you will contribute to the purchase*5 of the food supplement and so you will save the children life, and they couldn’t thank you as much as they will be happy !